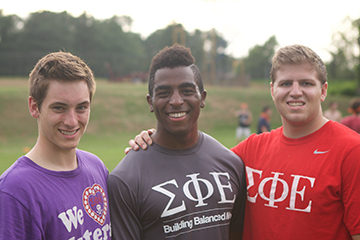 Sigma Phi Epsilon believes it must offer programming to complement the academic experience our undergraduates have in the classroom. The Fraternity offers five different local, regional and national leadership events designed not only to help brothers run a successful chapter, but to become stronger leaders for the rest of their lives. In a typical year, more than 5,000 undergraduates will attend at least one of these events. These events are a highlight of the SigEp experience for many undergraduates, who enjoy the opportunity to expand their network and become friends with brothers from other chapters. The Carlson Leadership Academy provides interactive officer training to over 2,600 undergraduates and volunteers annually. Many undergraduates run for executive board positions because they have great goals and visions for their chapter. Attending a Carlson ensures an officer will have the skills to manage a committee and follow through on those goals. The program also helps executive boards work together to ensure they all have goals consistent with a unified vision for the chapter. Current executive board officers, rising young leaders and volunteers should all attend this weekend program each spring. Life After College, SigEp’s newest leadership event, is focused on preparing upperclassman to be successful personally and professionally as they transition from college to the ‘real world.’ Today’s college students face an especially competitive job market and high expectations from employers who are looking for the perfect fit for their companies. Life After College is designed to equip SigEp upperclassmen with the guidance, tools and techniques they will need to stand out among job applicants and keep up with the life skills they will need when they are on their own. The Frank J. Ruck Leadership Institute is an intense five-day event for SigEp’s top rising leaders. The Fraternity’s best and brightest gather in Virginia over the summer for a program focused on personal leadership skills and the Balanced Man Ideal. Participants are stretched both mentally and physically, and pushed to explore their potential. Ruck scholars learn about their leadership styles, and how to apply them to different situations. The program’s mission is, “Teaching the few to impact the many,” and Ruck scholars all return to their campus ready to utilize their new skills to impact their campus and community. The Tragos Quest to Greece is a powerful overseas experience that is unmatched in the fraternity world. Participants undertake a 10-day journey through Greece to study classic writings and explore the origins of SigEp’s practices and principles. The undergraduates are joined by alumni mentors and a professor, who lead discussions about how classic writings and personal experiences relate to SigEp’s core values. SigEp’s Grand Chapter Conclave is the largest gathering of fraternity brothers in the world. Over 1,600 brothers and guests descend on one resort for five action-packed days every other summer. Imagine spending a long weekend at a beautiful resort — and every inch of it is filled with SigEps. From the golf course and the pool to the restaurants and bars, SigEps take over the town during this unforgettable event. Conclave provides a great opportunity to catch up with old friends, and make plenty of new ones from across the country.